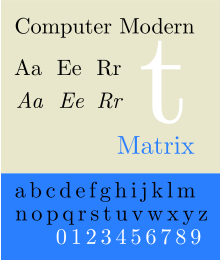 Computer Modern is the original family of typefaces used by the typesetting program TeX. It was created by Donald Knuth with his Metafont program, and was most recently updated in 1992. Computer Modern, or variants of it, remains very widely used in scientific publishing, especially in disciplines that make frequent use of mathematical notation. Computer Modern is based on late-1800s Didone type. Its direct inspiration, Monotype Modern, is at top; similar typefaces of the era included Century, Excelsior and Clarendon. As implied by the name, Computer Modern is a 'Didone', or modern serif font, a genre that emerged in the late 18th century as a contrast to the more organic designs that preceded them. Didone fonts have high contrast between thick and thin elements, and their axis of "stress" or thickening is perfectly vertical. Computer Modern was specifically based on the 10 point size of the American Lanston Monotype Company's Modern Extended 8A, part of a family Monotype originally released in 1896. This was one of many modern faces issued by typefounders and Monotype around this period, and the standard style for body text printing in the late nineteenth century. In creating the TeX publishing system, Knuth was influenced by the history of mathematics and a desire to achieve the "classic style" of books printed in metal type. Modern faces were used extensively for printing mathematics, especially before Times New Roman became popular for mathematics printing from the 1950s. The most unusual characteristic of Computer Modern, however, is the fact that it is a complete type family designed with Knuth's Metafont system, one of the few typefaces developed in this way. The Computer Modern source files are governed by 62 distinct parameters, controlling the widths and heights of various elements, the presence of serifs or old-style numerals, whether dots such as the dot on the "i" are square or rounded, and the degree of "superness" in the bowls of lowercase letters such as "g" and "o". This allows Metafont designs to be processed in unusual ways; Knuth has shown effects such as morphing in demonstrations, where one font slowly transitions into another over the course of a text. While it attracted attention for the concept, Metafont has been used by few other font designers; digital font designer Jonathan Hoefler commented that "Knuth's idea that letters start with skeletal forms is flawed" and Knuth commented "asking an artist to become enough of a mathematician to understand how to write a font with 60 parameters is too much." A sample gallery of many of the fonts from the CMU (Computer Modern Unicode) font family. Knuth produced his original Computer Modern fonts using Metafont, a program that reads stroke-based definitions of glyphs and outputs ready-to-use fonts as bitmap image files. He mostly left the font, as with other components of TeX, in the public domain, but made one request: that any derivative work based on Knuth's software not carry the same name, a request Knuth made to assure quality control. This stipulation is similar to the one found in the SIL Open Font License, and later derivatives of Computer Modern have been released under that license. Several such derivatives are now also widely used and included in TeX Live, a modern TeX distribution. Computer Modern was first transformed to a PostScript Type 3 font format by BlueSky, Inc. in 1988, and then to Type 1 in 1992 to include font hinting. The Type 1 version has since then been donated to the American Mathematical Society (AMS) which distributes them freely under the Open Font License. It is found in most standard TeX distributions. The Type1 to METATYPE1 to Type 1 roundtrip conversion process involved in the production of the Latin Modern fonts did try to preserve the hinting information of the BlueSky fonts; however it added rounding errors that do affect the quality of the hinting at low pixel sizes. As a result, on-screen display of the Latin Modern fonts can result in a less even display of kerning and character heights than is the case with the BlueSky fonts. The same process was later extended to some free PostScript font clones under the umbrella project called TeX Gyre. The Latin Modern font has also gained an OpenType math table. EC fonts – look much like Computer Modern, but have slightly different metrics. These were the first TeX fonts to use the "Cork encoding" (in LaTeX also known as T1 encoding) that provides precomposed glyphs for West-European languages. The original EC fonts were only available as Metafont generated bitmaps. TC fonts – the TeX Companion fonts provide a number of additional symbols commonly used in text. BaKoMa fonts – another automatically generated Type1 version of Computer Modern by Basil K. Malyshev, dating to 1994. The fonts remain available for download. CM-super – a very large extension of Computer Modern, available in a variety of encodings. These fonts were automatically vectorized from Computer Modern or EC font bitmaps and therefore lack the hinting information in the BlueSky fonts. Symbola Computer Modern Roman (or a font similar to it) was used as the basis for Symbola's European glyph set. Symbola, a font with an exhaustive set of Unicode symbols, was originally released into the public domain; versions released since 2018 have since required a license for commercial usage. STIX Fonts, a project to create Times New Roman-compatible mathematics fonts. Open-sourced under the SIL open font license. ^ "Knuth: Message about TeX fonts". Cs-faculty.stanford.edu. Retrieved 2015-06-12. ^ Donald Ervin Knuth (1986). Computer Modern Typefaces. Addison-Wesley Publishing Company. p. 10. ISBN 978-0-201-13446-9. ^ The Monotype Specimen Book of Type Faces. Philadelphia: Lanston Monotype Machine Company. 1922. Retrieved 17 August 2018. ^ Williamson, Hugh (1956). Methods of Book Design. Oxford: Oxford University Press. pp. 96–8. Throughout the first half of the 19th century, modern faces held the typographic field against nearly all comers. Not all typefounders and punch-cutters were very enthusiastic about this kind of type-face, but the popular demand had to be met. ^ McGrew, Mac (1993). American Metal Typefaces of the Twentieth Century (Seconde édition révisée. ed.). New Castle: Oak Knoll Press. pp. 220–221. ISBN 0-938768-39-5. In the early 1900s Monotype adapted a number of modern roman text faces to its system, mostly in a few small sizes only; some of them differ from each other only in slight changes of their proportions. ^ Knuth, Donald (1986). "Remarks to Celebrate the Publication of Computers & Typesetting" (PDF). TUGboat. 7 (2): 95–8. Retrieved 24 September 2015. ^ Knuth, Donald (1982). "The Concept of a Meta-Font" (PDF). Visible Language. 16 (1): 3–27. Retrieved 25 September 2015. ^ Hoefler, Jonathan. "Knuth's idea that letters start with skeletal forms is flawed. But his work is important and had lasting impact". Twitter. Retrieved 18 August 2018. ^ "Blue Sky Research and Computer Modern fonts". Math.utah.edu. 1997-12-04. Retrieved 2015-06-12. ^ "The Adobe Type 1 fonts, previously known on CTAN archives as the "bluesky" fonts, are now distributed as part of the AMS fonts distribution, at CTAN:fonts/amsfonts". Ctan.org. Retrieved 2015-06-12. ^ "FAQ - ConTeXt wiki". Wiki.contextgarden.net. Retrieved 2015-06-12. ^ "A E F and T sized differently in lmodern pacakge? • Fonts & Character Sets • LaTeX Community". Latex-community.org. Retrieved 2015-06-12. ^ "The New Font Project : TEX Gyre" (PDF). Tug.org. Retrieved 2015-06-12. ^ "The Latin Modern Math (LM Math) font ��� GUST" (in Polish). Gust.org.pl. Retrieved 2015-06-12. ^ "Package lm-math". Ctan.org. 2014-09-05. Retrieved 2015-06-12. ^ "tex-archive/fonts/ps-type1/cm-super". Ctan.org. Retrieved 2015-06-12. ^ "The Latin Modern (LM) Family of Fonts — GUST" (in Polish). Gust.org.pl. Retrieved 2015-06-12.